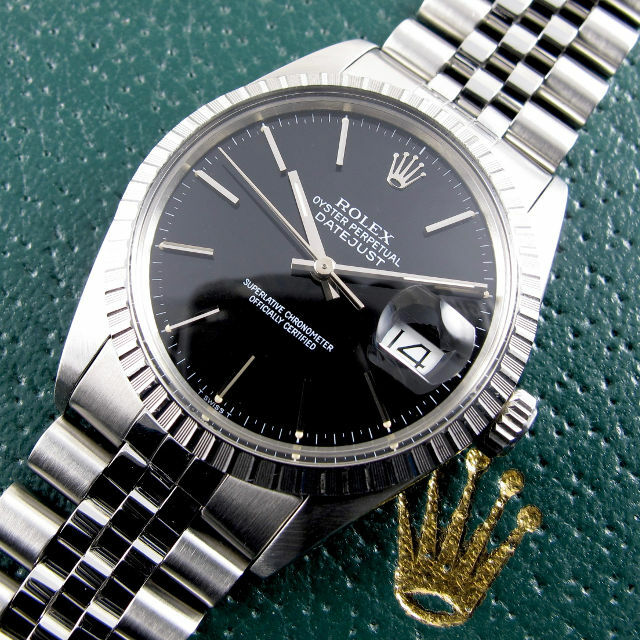 Opening this week’s newsletter is a Rolex Oyster Perpetual Datejust Ref. 16030 from c. 1985 with an immaculate, black, satin finished dial. This model has Rolex’s calibre 3035 movement with hack feature and quick date change via a secondary crown setting. The watch is fitted with its original stainless steel Rolex Jubilee bracelet with folding clasp. 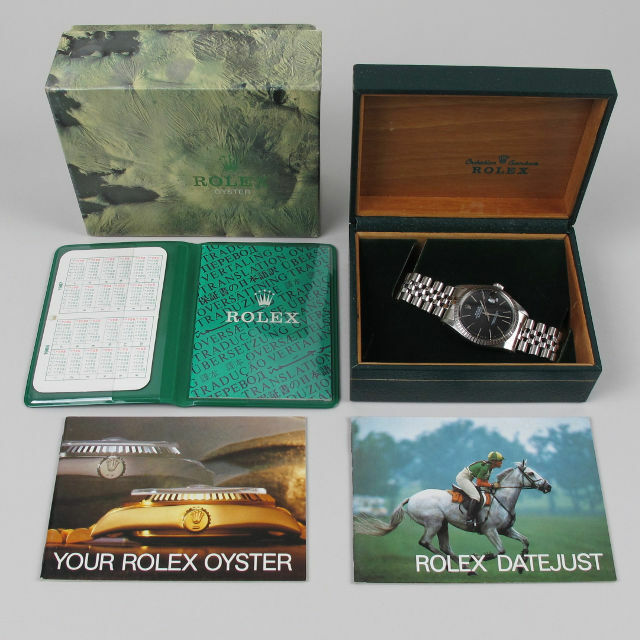 Accompanying the watch are inner and outer Rolex presentation cases, Rolex Oyster and Datejust booklets, green folder with a Rolex calendar card for 1986-1987 and Rolex chronometer booklet – please note that the original certificate is no longer with the watch. 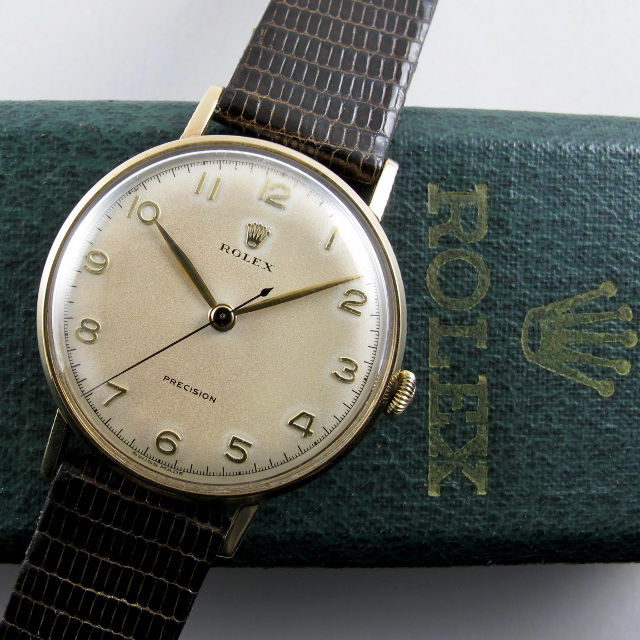 Next is a very attractive Rolex wristwatch which is hallmarked for the year 1954. The watch has a superb, 9ct yellow gold case, the sides and lugs of which are milled in a ‘coin-edge’ style, a design seldom seen on vintage Rolex watches. The dial is in lovely condition with a wonderful, warm patina and the gold coloured leaf hands contrast with the blued steel of the centre seconds hand. Manually wound, the movement is a Rolex calibre 1210 with 17 jewels and the watch is accompanied by its original Rolex presentation case. Interestingly, in the 1954 Rolex catalogue, this model was listed at £54, some £5 more expensive than the recently released Rolex Explorer which was selling in the same year for £49. 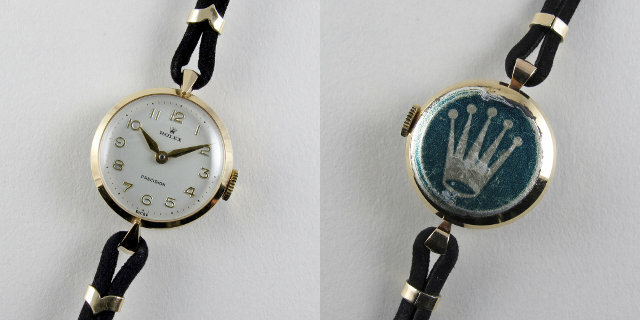 Next is a lady’s Rolex wristwatch which dates to 1960. In excellent original condition, this wristwatch appears to have been only very lightly used and still retains its original green Rolex factory sticker to the outside back. The silvered dial has raised gilded Arabic numerals and Alpha shaped hands. Cased in 9ct yellow gold, the single-set lugs are angular and centrally faceted and are fitted with the original black suede strap with Rolex, gilt-metal, pin buckle. Photographed here is a Cyma Watersport, rectangular wristwatch which was made in c. 1940. 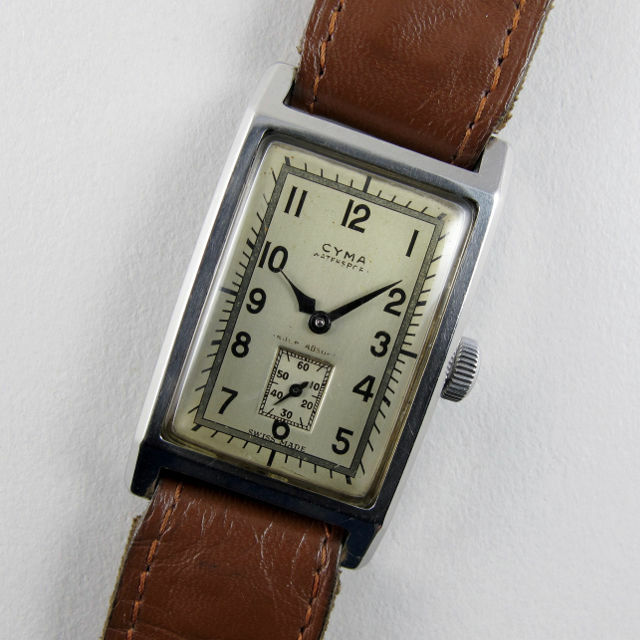 A super looking vintage wristwatch, this Cyma has a water-resistant type rectangular case. The case is made to the specifications of Swiss patent 189190 which was issued to Schmitz Frères & Co. S.A. in 1936. The patented design was licensed to a variety of different manufacturers, including Gallet, the latter marketing the design under the name ‘Clamshell’. Essentially, the design related to a two-part case with 4 screws fitted to the underside which clamped the upper and lower case components together; in conjunction with a synthetic crystal, which had a broad lip underneath the bezel, and the use of a water-resistant capped winding crown, an impermeable seal was formed. The silvered dial has a two-tone finish and black Arabic numerals. Above is an early example of the Tudor Oysterdate Ref. 7966, this piece dating to 1959. The watch has a silvered dial with an unusual circular satin finish and combination baton and multi-faceted dagger numerals. 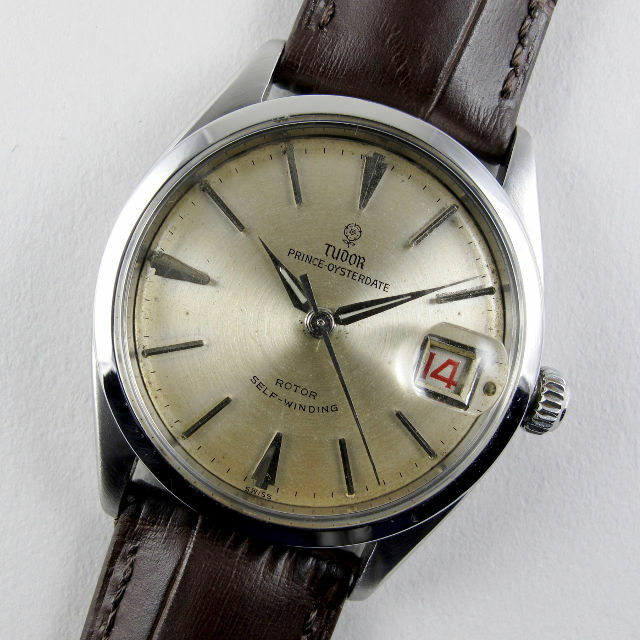 The Alpha hour and minute hands are typical of the 1950s period and the calendar aperture has a ‘roulette’ disc which alternates between red and black dates. Cased in stainless steel, the robust Rolex Oyster case has the typical screw-down crown and case back. 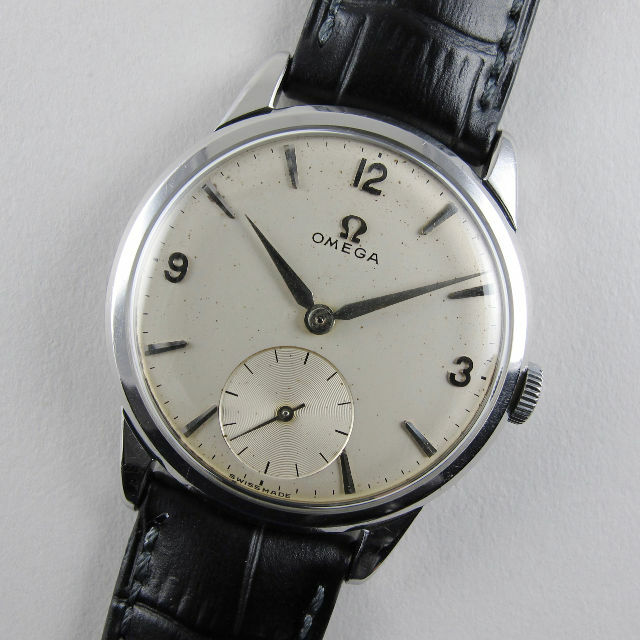 This smart, vintage, Omega wristwatch has a silvered dial with applied Arabic and faceted dagger numerals. 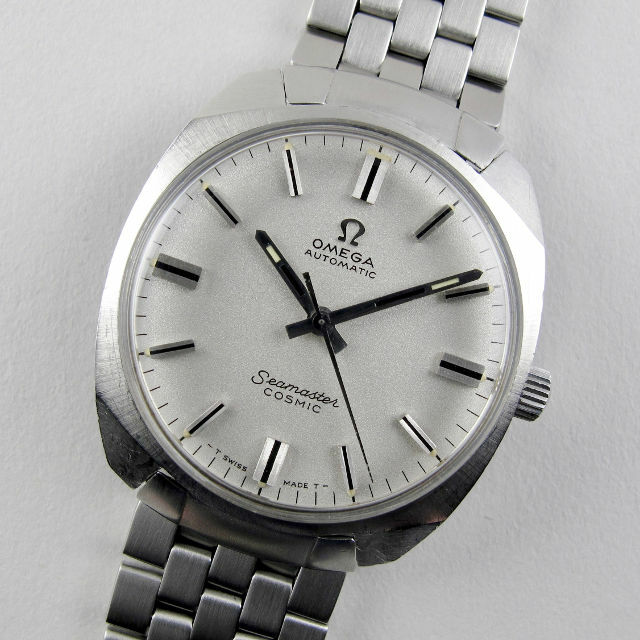 Made in c. 1959, the stainless steel case was made for Omega by the Dennison case company and is a Dennison Ref.13332. 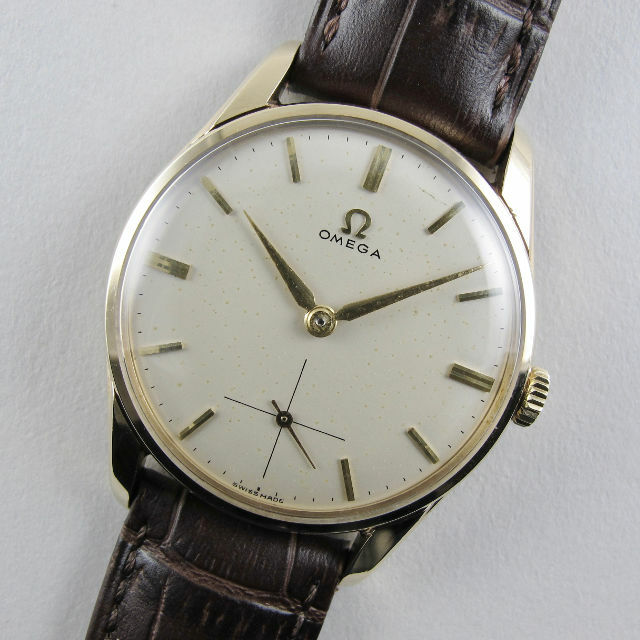 The manually wound movement is a calibre 267 which is from the highly regarded Omega ’30’ series. Also with an Omega calibre 267 movement, the 9ct yellow gold Omega wristwatch shown above is a Ref. 923 model from 1958. The watch has a substantial gold case with attractive, down-turned lugs that have stepped edges. 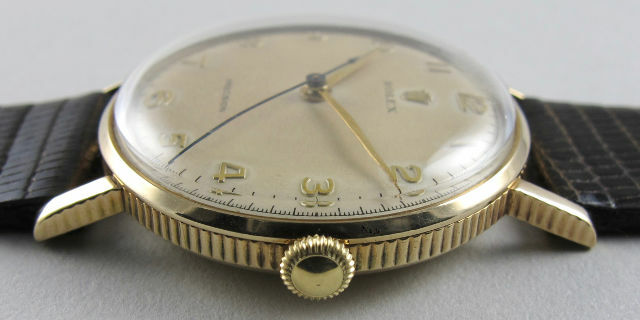 This watch retains its original 9ct yellow gold Omega pin buckle. Next is an unusual Omega Seamaster Cosmic model from 1968 with automatic calibre 552 movement. This watch has a handsomely stark, light grey dial, with finely stippled surface and applied indexes which have finely ribbed surfaces and are centrally set with black inserts. Cased in a single, solid block of steel, the cushion shaped case has a satin finished bezel and faceted down-turned lugs. The watch is fitted with a detachable, stainless steel, Omega link bracelet with adjustable folding clasp. 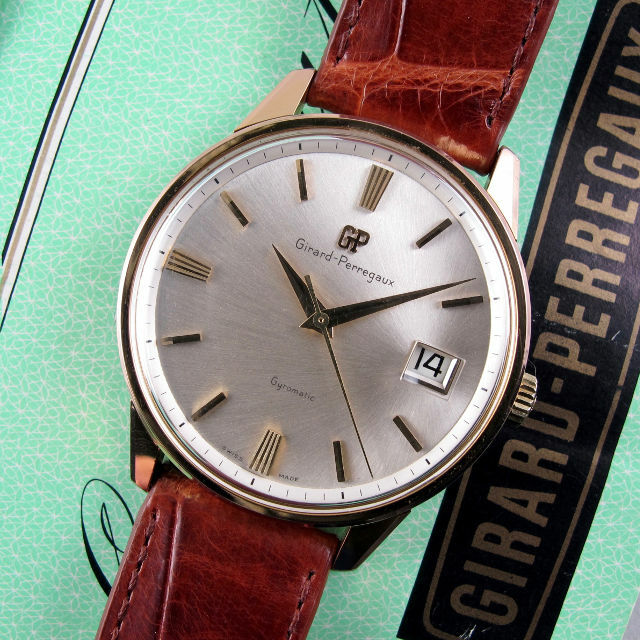 The Girard-Perregaux ‘Gyromatic’ wristwatch shown above dates to circa 1968 and comes with a guarantee booklet and presentation case. In lovely condition, this watch has a crisp, clean design with a satin finished silvered dial that is accented with multi-faceted indexes. The crystal has a magnified sector above the date aperture, this magnification is contained within the crystal and therefore the surface of the crystal remains smooth and flat. The two part case has a gold plated upper body and separate screw-down case back. This is an automatic model which is powered by the Girard-Perregaux calibre 31.09. 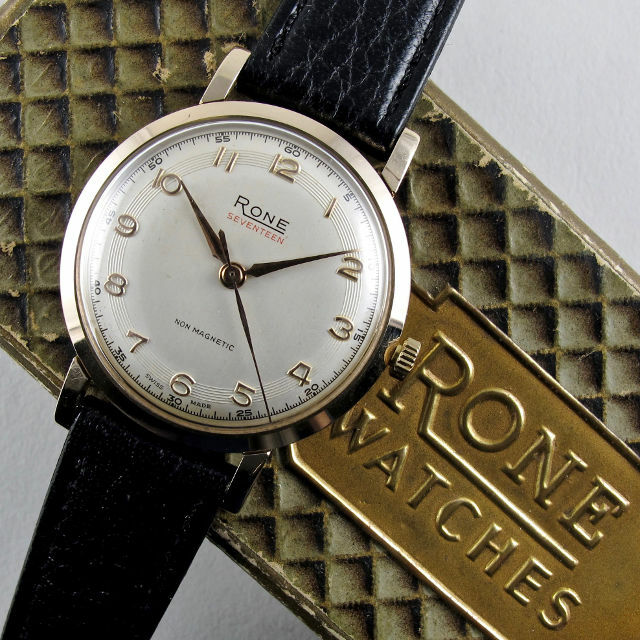 This smart, mid-century wristwatch was made by Rone in 1958. The watch has a 9ct yellow gold case and a silvered dial which has an unusual chapter ring composed of concentric, engine-turned rings with raised Arabic numerals above. This watch is accompanied by its original Rone branded presentation case and a rather charming booklet which explains how the watch works, as well as details on how to care for it. We’re excited to release a new wristwatch wrap which has been designed and made in England exclusively for Black Bough. 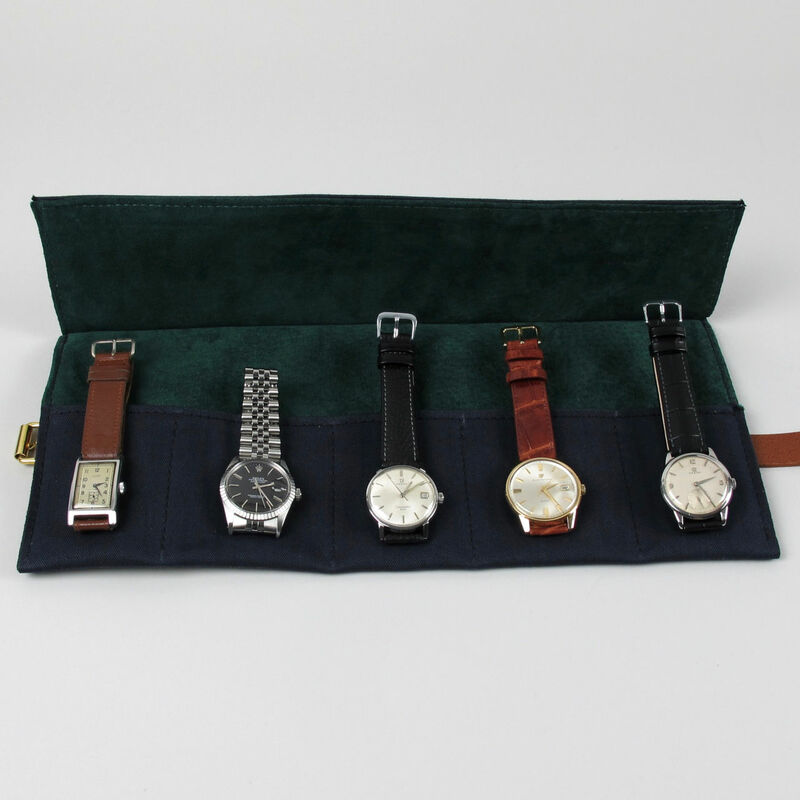 These high quality 5 pocket watch wraps are made from navy blue, Japanese Herringbone canvas (100% cotton) and are fully lined with dark green suede. 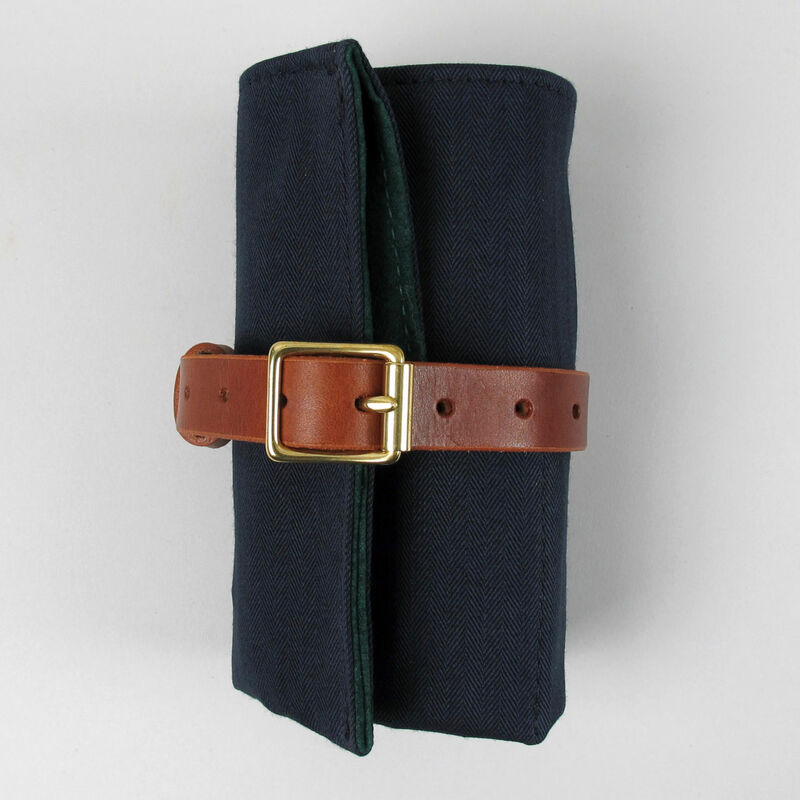 The wraps are secured by a tan coloured bridle leather belt with brass buckle. Super smart, these wraps are ideal for travelling or storage.